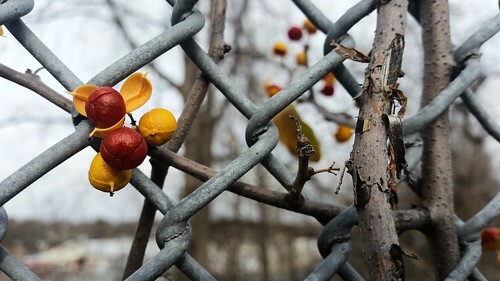 A chainlink fence with intertwining branches and yellow berries bursting with a large red seed. I know that some of the photos that I take are dull, boring, or just a means for me to reflect on what is going on in my life. But occasionally, I produce some gems and I feel like this is one of them. While walking home from breakfast, I saw the berries with their seeds bursting out and knew that with their red and yellow vibrances juxtaposed the gray fence and brown branches that it needed to be captured. I recommend clicking through to see the photo on Flickr to see it in full as I think this smaller version doesn't do it justice. The unfocused background and crisp view of the fence, branches, and berries provides a great contrast.